भाव सूत्र 24: जन्म लग्नं असिद्धम्। काललग्नं तु होरा लग्नं। होरा घटिका लग्नचोर्गणनं वृद्धैरुपबृहितम्। तत्प्रथमपादे होरादयस्थिद्धाः इति प्रथम पादेदतिन्य सूत्रावसरेप्रादर्शि। जन्महोरा घटिका लग्नेषु त्रिष्वपियेन केन चिदेकेन ग्रहेण दृष्टेषु सत्सु राजानो भवन्ति। A planet/planets aspecting all three Lagnas viz. 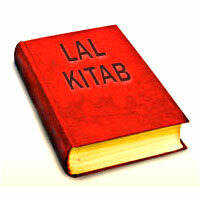 janma Lagna, Hora Lagna and Ghatika lagna give rise to a powerful Rajyog. Thus the influence of same planet/planets on all the three lagans produce a yog which is capable of giving the native a very high governmental status. Note : In the old days such a combination would make the native a king but in modern era such a yog is capable of taking the native to very high status with government. In case the multiple and powerful planets influence on above said lagans one may become head of country or a state as the case may be. भाव सूत्र 25: लग्न सप्तमयोक्ष बलाबल परिज्ञानेन प्राप्तराशिं गृहीयात्। तल्लग्नं नवांशलग्नं द्रेक्काण लग्नं च राशि नवांश द्रक्काण कुंडलीत्रयभेदेन यःकश्चिदेको ग्रहः प्रपश्येद्यति तर्हि राजयोगो जायते। राशिर्जन्मकाले चन्द्राक्रान्त राशिं व्यनक्तिनतु लग्नमिति नीलकंठादयः। तन्नलग्नचन्द्रयोः लग्नस्यैव प्रबलतरत्वात्। पूर्व सूत्रे ‘जन्मेति’ पदप्रयोगात्, अस्मिन सूत्रे च ‘पत्नीति’ शब्द प्रयोगात् लग्नस्यैव कंठरवेणोक्तत्वात्। राशिनवांश द्रेक्काण लग्नानांतसप्तमस्थानानां चैकदृष्ट त्वमिति केचित्। तन्न। षणां स्थानाना युगपदेक ग्रहदृष्टेः बहुविरलत्वात्। If a planet or many planets influence the Rasi or its 7th house, whichever is stronger, in natal chart, Navamasha Lagna in Navamsha and Drekkana lagna in Drekkana chart a powerful rajyog arise. 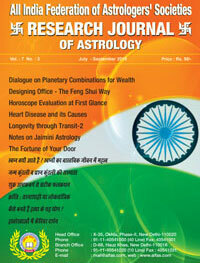 The word “Rasi” stands for the sign occupied by the Moon in the natal chart. Since the word ‘Janama’ is used in the above aphorism is indicative of that Janma lagna should be given importance over the Moon sign. Important : How to access whether Janama Lagna is strong or its 7th house. In this regard Neelkaanta suggests to adopt method as detailed under. Though this method was explained in detail in the earlier articles also but to refresh the memory these are given here: 1. In case Lagna is occupied by a planet and its 7th house lies vacant in that case Janma lagna will be stronger than the 7th house but in case Lagna is vacant while 7th house is tenanted by a planet in that case 7th house will be stronger of the two. 2. In case Janma lagna has more than one planet while its 7th house is having one planet in that case too Janma lagna will be treated as stronger out of the two. In case the order is reverse 7th house will be termed as stronger of the two. 3. In case Janma lagna and its 7th house, both are tenanted by a planet each in such a case out of the two one becomes the lord of house it is occupying in that case the house occupied by its own lord will be considered stronger of the two. 4. In case Janma lagna and its 7th house, both are vacant, in such a case strength of house will be decided by the placement of house lord. Which ever planet out of lord of Lagna or its 7th house is stronger by being in its own sign, in its mooltrikona sign, in its sign of exaltation or it is one out of Atmakarka or Amatyakarka, in that case house whose house lord is disposed in such a manner will be stronger of the two. 5. In case both the houses are tenanted by a planet each in that case the house having a planet with larger longitudes as compared to other will be termed as stronger of the two. Thus these are the guidelines to access the strength of the house. Note : Neelkanta, while commenting over the sutra has given emphasis on the Moon sign where as other commentators hold the view that importance should be given to Janama lagna and the 7th house from it. भाव सूत्र 26: राश्यंशद्रेक्काणेषु जन्मकाल घटिकासुवाऽपि द्वयोर्लग्नयोः एकग्रह दृष्टोस्सतोः न्यूनराजत्वम्। अत्र अद्धसम्मतिः श्लोकः विलग्नघटिकालग्न होरालग्नानि पश्यति, उच्चग्रहे राजयोगो लग्नद्वयमथाऽपिवा। यद्धाराशि दृगाणाभ्या लग्नद्वयमथाऽपिवा, प्रायेणांयं जातकेषुप्रभूणामेव दश्यते। Out of the three lagans viz. Rasi, Navamsha and Drekkana, if any two of the three lagans are influenced by the same planet/planets as mentioned in the previous sutra rajayog arises. Same way in case two out of Janama lagna, Hora Lagna and Ghatika Lagna are being influenced by the same planet/planets by placement or aspect even in that case rajayog is formed. Some of the commentators have given importance to aspect of exalted planets only. But there is one condition which is capable of making this rajayog more potent and powerful. In that case the aspecting planet as mentioned above is exalted in Arudha Lagna or conjoined with the Moon or Jupiter or Venus at the same time virodhargala sign lies vacant the rajyog becomes more and more potent. भाव सूत्र 27: जन्मेति सूत्रोक्त राजयोगमंश दृगाणयोरति दिशति। यथा जन्मलग्न कुंडल्यां लग्नत्रयस्यैक ग्रहदृष्ट्या राजयोजोडभिहितः। तथैवांश कुंडल्यां द्रेक्काण कुंडल्यां तत्रत् लग्नत्रयस्य एकग्रहदष्टत्वेन राजयोगो वाच्याः।। Just as the influence of planet/planets on Janmalagna & Horalagna or Janmalagna & Ghatikalagna in Natal chart give rise to Rajyog. Similar results should be ascertained with reference to Navamsha chart and Drekkana chart. सूत्र: चन्द्रशुक्रयोर्मिथोदृष्टयोः सिंहस्थयोवी यानवन्तः। In case the Moon and Venus mutually aspect each other, Vahana yog exists which means the native will be having luxurious four wheeler. In case this Moon and Venus are placed in 3rd and 11th position from each other, native enjoys a powerful Vahana yog but house falling between 3rd and 11th should lie vacant. This yog is more potent in case these two planets are free from any malefic influence. This disposition of the Moon and Venus, when free from the influence of malefic planets by aspect or association it gives all sorts of luxuries to the native. भाव सूत्र 29: आरुढलग्ने कुजशुक्र केतुषु स्थितेषु वितानादि राजचिन्हवन्तो भवन्ति। तेषु मिथोदृष्टिमत्सु परस्परं तृतीयस्थेषु वा वितानादि राजचिन्हवन्तो भवन्ति। अथवा शुक्रकुजकेतुषुमिलित्वा आरुढ़लग्नं पश्यत्सु राजचिन्हवन्तो भवन्ति। In case Venus, Mars and Ketu, all the three planets be placed in Arudha Lagna Vaithanika Yog forms. In case one or two planets out of three mentioned above are placed in Arudha Lagna and third one aspect these two even than Vaithanika yog is caused. This yog enables one to wear royal insignia. Note : Here the Sage appreciate the influence of Venus, Mars and Ketu on the Arudha lagna by placement or aspect. In old days people used to wear royal emblem on their body but in modern era people with this combination are seen have royal insignia implanted on their vehicles etc. भाव सूत्र 30:आत्मकारकात् द्वितीयचतुर्थ पंचमाष्टमनवअमावेषु शुभग्रहेषु सत्सु राजानो भवन्ति। द्वितीयचतुर्थ पंचम भावेषु तुल्येषु शुभेषु सत्सु राजत्वमिति नीलकंठः। Rajyog is caused when the 2nd, 4th, 5th, 8th and 9th houses from Atmakarka are influenced by benefic planets. Here Neelkanta opines and emphasizes the influence of benefic planets on the 2nd, 4th and 5th houses only. Note : In one or the other Neelkanta’s views are commendable since 8th house is a malefic house and Sage Jaimini does not consider even 9th house as benefic. भाव सूत्र 31ः आत्मकारकात् तृतीयषष्ठयोः पापयोश्च राजत्वम्। Equal number of malefic planets influencing the 3rd house from Atmakarka produces Rajyog. भाव सूत्र 32: कारके निरुक्तं योगद्वयंलग्नसप्तमयोरतिदिशति। ग्रहचक्ररीत्या लग्नाधिपतेः सप्तमाधिपतेः वा द्वितीये शुभे तृतीये पापे चतुर्थे शुभे पंचमे शुभे षष्ठे पापे सप्तमे शुभे अष्टमे पापे नवमे शुभे राजयोगः। मणिप्रवालन्यायेन द्वितीये शुभे तृतीये पापे चतुर्थे शुभे पंचमे पापे षष्ठे शुभे सप्तमे पापे अष्टमे शुभे नवमे पापे महाराजयोगः। अत्र पंचममारम्य पूर्व योगापेक्षया विरोध इति न शंकनीयम। द्वितीयस्य महाराज योगत्वात् प्रथमस्य सम्पन्नमात्रविषयत्वात्। अत्र सर्वधा द्वितीयेन शुभेन तृतीयेन पापेन चतुर्थेन शुभेन भवितव्यम्। Taking into consideration as detailed in above sutras rajayog is formed when planets are placed in an specific order which is, benefic in 2nd, malefic in 3rd, benefic in 4th, malefic in 6th, benefic in 7th, malefic in 8th, and benefic in 9th house when counted from the lord of janmalagna of from the lord of 7th, which ever is stronger of the two. The doctrine of word ‘Manipravala’ displayed in sutra the Maharaja yog. Note : The Sage require the benefic and malefic planet strictly in order as detailed above but all houses cannot have planets in the order displayed. Hence maharaja yog from some of the houses are occupied and others are aspected by the planets but one has to follow the rules of benefic as well as malefic planets in the order specified. भाव सूत्र 33ःपूर्वोक्त योगे शुभपापग्रह मिश्रणे सति राजतुल्याः भवन्ति। In case the planets influence the above said houses in a specified manner but the influence happens to be mixed one ie. Benefic and malefic planets influencing the specified houses a rajayog is formed. भाव सूत्र 34: यदि शुभस्थाने पापाः पापस्थाने शुभास्तर्हि दरिद्रा भवन्ति। In case benefic planets influence the house which require the influence of malefic planets and simultaneously malefic planets influence the houses requiring influence of benefic planets the results will lead to poverty and miseries. भाव सूत्र 35: लग्नेशात्सप्तमेशाद्वा कारकापेक्षया पंचमे गुरुर्वा शुक्रो वा चन्द्रो वा यदि राजकीयौ भवति। अत्र राजकीयशब्दस्य अमात्यत्वेन परिगणने प्राक राजयोगस्योवतत्वात् पश्चात् सेनाधिपयोगस्य वक्ष्यमाणत्वात्। After commenting upon Rajayog now the Sage explains Amatyayog. The word “Rajkeeya” used in the sutra is a complimentary to the Rajyog since it is next to Atmakarka. Thus yog formed by the involvement of Amatyakarka is next to Rajayog, meaning by a person who acts as an advisor to the king. Hence in case Jupiter or Venus or the Moon when happen to influence the 5th house from Amatyakarka becomes a minister to the king. In today’s pariance one may be MLA or a very close advisor to the highest person of state or country. भाव सूत्र 36ःतृतीये षष्ठे वा यदि पापग्रहः स्यातर्हि सेनान्य भवन्ति। If the 3rd or 6th or the both planets as counted from janmalagna or its 7th house or from the house occupied by Amatyakarka are occupied by the malefic planets only the native is destined to hold a very high position in the army or police services. May become chief depending upon the strength of planets in above said houses. भाव सूत्र 37: पदकारकलग्नेम्यः तृतीयषष्ठगत ग्रहदृष्ट्या तथा पंचमेश दृष्टया च धीमन्तो भवन्ति। स्वपितृभ्यां इति दारेशेत्यादि सूत्र चतुष्टये अन्वेति। In the above sutra the Sage refers to combination or yog which tells about the intelligence. This yog is formed as under : By the influence of planet/planets on the 3rd house as counted from janamalgana, Arudha Lagna or Atmakarka. By the aspect of 3rd and/or 6th lord on Janmalagana, Arudha Lagna or on Atmakarka. By the aspect of 5th lord on Janmalagana, Arudha Lagna or on the Atmakarka. भाव सूत्र 38: चतुर्थाथिपतिदृष्ट्या सुखिनो भवन्ति। The influence of 4th lord, by placement or aspect, on Janmalagna or Arudha lagna or on Atmakarka makes one to live a happy life. भाव सूत्र 39: अष्टमाधिपतिदृष्ट्या दरिद्रा भवन्ति। The influence of 8th lord from Janmalagna, Arudhalagna or from Atmakarka when influence any of the three as mentioned above makes one a poor. Note : In this sutra the sage has emphasized on the penury yog formed by the influence of 8th lord on Janmalagana, Arudhalagna or from Atmakarka. But here sign Aries and Libra should be omitted in case any of the two happens to be the Lagna, Arudhalagna or occupied by Atmakarka since in both the cases 8th lord is same who is lord of above said lagnas or occupied by the Atmakarka. At the same time Sign Aries is a positive sign of Mars in comparison to Scorpio while Libra is positive sign of Venus as compared to Taurus. Hence these two signs and lords should be omitted from the rule as mentioned above. 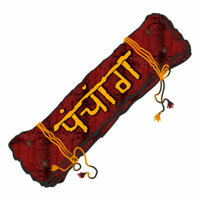 भाव सूत्र 40: द्वादशाधिपतिदृष्ट्या वितव्यय शीलवन्तो भवन्ति। The word Ripu used in Sutra refers to 12th house (Ri-2, Pu=1, therefore 12) thus meaning by that the native spends money without any cause in case the lord of 12th aspects. Note : Here the sage has restricted to the aspect of lord of 12th house! But he is silent about the aspected planet or house. Thus it should be taken from Janma Lagna, Arudha Lagna, Karakamsha Lagna and Atmakarka. Hence when planet who is lord of 12th from any of above lagna or Atmakarka and that planet aspects the referral lagna or Atmakarka respectively the native wastes money or one is spendthrift. भाव सूत्र 41: तत्तदीशदृष्ट्या प्राबल्यवन्तो भविन्त। ‘अष्टम’ इत्यादिना निर्धन योगास्सगृहीताः। लग्न त्रिकोणे द्वयोः पापयोः मिलितयोः लग्न पश्यतो स्सतोः विशिष्य दरिद्र योगः द्वितीये पाप योगेऽपि दरिद्र योगः। तथा च वृद्ध कारिकाः श्लोक: लग्न त्रिकोणे द्वौपापौ मिलितौ यदि पश्यतः। जन्मलग्नं विशेषेण यौगौ दारिद्रयनाशकः।। एवम् धनेऽपि द्रष्टव्यं महतदारिùनामकम्। दारिद्रय राजयोगादीन् सर्वात् योगान विचिन्तयेत्।। चन्दरारुढ तु जन्मकाले चन्द्राश्रितो यो राशिः तद्राशिपदात्मकम्। तग्नारुदेन ये योगाः निर्वर्तिता ते सर्वे चन्द्रारुढनापि यथा लक्षणं निर्वर्तनीचत्वे न विचारणीयमः। In the above sutras and slokas the sage has tried to explain various combinations leading to penury/poverty yogs. These yogs are as under : 1. 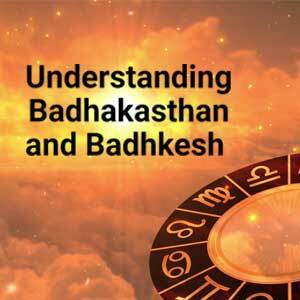 If two malefic planets are posited in 5th or 9th house from Janma lagna, Arudha lagna, Karakamsha lagna or Atmakarka and simultaneously these planets aspect the above mentioned lagans or Atmakarka respectively will make one’s financial status very low. 2. The similar results may arise in case the 2nd house from above mentioned two malefic planets occupy lagans or Atmakarka. 3. In case two malefic planets are posited in the 2nd house from Arudha lagan at the same time these planets aspect the janama lagan, one will lead the life of penury/poverty. 4. If Arudha lagan happens to be a malefic sign, occupied malefic planet/planets at the same time it is aspected by the lord of 8th house (here the 8th house should be considered from Arudha Lagan) and this is not aspected by any other planet/planets, the combination one a poor. 5. Same way if Janma lagan is tenanted by malefic planet/planets and further it is under the aspect of 8th lord from Janama lagan. Janma lagan is unaspected by any other planet/planets makes the native a poor. 6. If Arudha lagan is a malefic sign or occupied by malefic planets and it is further aspected by a debilitated planet and unaspected by any other planet one will be a poor. 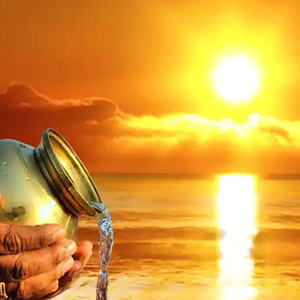 The sage further emphasizes to judge the above mentioned combinations from Chanderarudha (Chanderarudha is calculated from the sign occupied by the Moon.) Note : The commentator has categorically mentioned two malefic planets in various lagna and at the same time he emphasizes that it should not be aspected by any planet/planets but he has not differentiated between the aspect of malefic or benefic planet/planets. It can be presumed that the aspect of strong benefic planet/planets can nullify the malefic influence of above mentioned yogs. Same way the learned sage is silent about the Aries and Libra lagan. In both the cases 8th lord will be lagan lord also or in case any of these two signs become janam lagan or Arudha lagan the yogs above mentioned stand defunct since in both the cases the Mooltrikona sign will be falling in lagna. Same way in case of sign Aries becoming lagna or Arudha lagan its lord, Mars, should not be treated as a malefic planet even if posited in lagana or Arudha lagana. भाव सूत्र 42: लग्नात् कारकात् आरुढ़ लग्नाद्वा द्वादश द्वितीययोः पंचमनवमोः द्वादशषष्ठयोः एकादश तृतीयौः चतुर्थ दशमयोर्वा ग्रहतौल्ये एकश्चेदेकः द्वौ चैत् द्वौत्रयश्चेत् त्रयः इति रीत्या ग्रहसाम्ये सति बंधः कारणतनं भवति। एवं पूर्वोक्तराशीनां तदीशनां च शुभ ग्रहे संबंधे सति निरोधमात्रम्। पापग्रहैः श्रृखलादिमिराहतिर्भवति। आपद्योगाः फलरत्नमालायम् ।। श्लोक 1: कर्म स्थाने वेश्यगेहेच दुष्टाः। लाभ स्थाने चेत् तृतीयेऽथवाचेत्।। नीचे सौम्ये क्षीणचन्द्रे नाराणाम्। बन्धः प्रोक्तो दीर्घकालं मुनीन्द्रै।। श्लोक 2: उच्चैः दृष्टे स्थान्निरोधेस्य नाशः नीचः दृष्टै श्रंृखलादिप्रहार।। सौम्यै दृष्टे स्यान्निरोधेऽपि सौख्यम्। द्रष्टव्यं स्यादेवमेवं दशासु।। श्लोक 3ः नीचैः पापैः वर्ष संख्या शुभैस्तु। मासा प्रोक्ताः पापरवेटै स्तथौश्चै।। सौम्यै दृष्ट स्यान्निरोधेऽपि सौख्यम्। द्रष्टव्यं स्यादेवमेवं दशासु।। श्लोक 4ः नीचैः पापै वर्ष संख्या शुभैस्तु। मासा प्रोक्ताः पापखेटै स्तथौच्चै।। सौम्यश्शुद्धैः वासरा स्वोच्चसंस्थौः। नाडयौ वा स्युः वाग्व्यथा व निरोधे।। Vide sutra 42 sage enunciates a few combinations for imprisonment. How ever imprisonment/bandhan yog for some crime or for some good cause depends upon combinations as under : One should see the pair of houses 2nd & 12th or 3rd & 11th or 4th & 10th or 5th & 9th or 6th & 8th from lagan or Arudha lagan or Karkamsha lagan or from Atmakarak are tenanted by equal number of planet/planets the yog for imprisonment arises. For example if the 2nd house and 12th house are tenanted by one planet each one will go behind the bars. But if 2nd house is having one planet while 12th is having two the bandhan yog stands cancelled. Same way one should treat the other pair of houses. In case any of the above pair is tenanted by natural benefic planets or the lord of concerned houses is connected with benefic planets one will go behind the bars but will be released soon. In case any of the above pair of houses is tenanted by malefics only and the lord of these houses also connected with malefic planet/planets one will be imprisoned for some serious cause and may be beated by the chains. Some Calamitous Yogs 1. If the 4th and 10th houses are occupied by the malefic planets only. 2. If the 3rd and 11th houses are occupied by the debilitated benefic and the waning Moon (with in 70 degree to the Sun) a long term imprisonment will be imposed on the native. 3. In case the above mentioned combination is under the influence of a powerful benefic, one will left out after taking into custody. 4. In case the combination mentioned vide point No. land 2 is influenced by debilitated planet/planets one will be beaten by chains. 5. If the same combination is under the influence of natural and powerful planet/planets one will be comfortable even in custody. 6. Imprisonment will go for years if the said combination is under the influence of debilitated malefic planets only, it will be for months in case the influencing planet/planets are debilitated benefic planet/planets, it will be for weeks in case the influencing planet/planets are exalted but malefic planet/planets, it will be for moments only in case the influencing planet/planets are exalted benefics. भावार्थ: शुक्रात लग्नात् गौणा पदस्थ पंचमारुढस्थ राहुः रविणा दृष्टश्चेत् नेत्र हानिनिर्मवति। If the Arudha or the Paad lagan of 5th house (also known as Mantra Arudha) is occupied by Rahu and aspected by the Sun one may lose one’s eyesight. भावार्थ: आत्मकारत् चतुर्थगयोः चन्द्रशुक्रयौः आतोद्यं राजचिहूनि च भवन्ति। If the Moon and Venus are conjoined in the 4th house from Atmakarka give a musical instrument and insignia of royalty. Note : The word musical instrument should not be applied verbatim. Sage opines that one will be well versed in using musical instrument and by royal insignia means one will be decorated with some state level or national level honour. Important : This is the first part dealing with yogs good or bad. In the second part more of these yogs will be taken up along with appropriate examples.